GBA Snood (USA) "Time Attack Mode" in 05:51.02 by theenglishman. 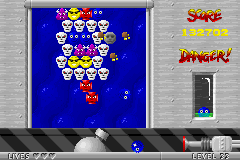 Snood is a puzzle game that blatantly rips off inspired by Bust-a-Move/Puzzle Bobble with very similar gameplay. Originally released for the PC as freeware, it has since been licensed and ported to several platforms. This movie by theenglishman plays the Time Attack mode so quickly that you might not be able to tell what's going on.